I think if you look up "pedantic" in the dictionary you might well get a hyperlink to my previous post. I stand by the idea, but am a bit embarrassed by the reality of it, I guess. 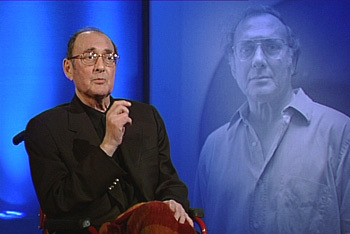 Meanwhile, my favorite genius curmudgeon, Harold Pinter, made an appearance on BBC's Newsnight a couple weeks ago. He sat for a far-ranging interview that covered a lot of ground, including the fact that he is determined to perform Samuel Beckett's Krapp's Last Tape at the Royal Court Theatre in London this fall. The play is about an extremely old man listening to a tape of his own voice from 30 years earlier, reflecting on life, etc. My older brother Rob recently recommended that I make a recording of the young Krapp's taped lines to have in my back pocket in old age should the urge to perform Krapp ever wield its ugly head -- it would be a rare thing, indeed, to have an actual recording of the same actor's younger voice to use. I have a feeling that it would be a self-fulfilling prophecy, and if I actually record young Krapp's lines, I will, indeed, make a point of doing the play at some point in my dotage. Perhaps I should add that to the to-do list. In any event, Mr. Pinter was fascinating and precise as ever. But at the end of the interview he read a short [seriously ... like 1 minute ... ] new piece called Apart from That. Pinter read along with the disembodied head of Rupert Graves on some kind of remote video hook up. It's a piece inspired by Pinter's loathing of mobile phones and all they represent. It is short and sweet, but cutting in its commentary on how disconnected we've become while simultaneously being in constant "touch." It is doubly moving when one considers the serious health problems Pinter has faced in recent years, with more than one Certs encounter with Death. Thankfully, some smart person managed to swipe a recording from the Web because the BBC takes such things down within a week. So here's a link to a video of Harold Pinter performing Apart from That. It's worth watching just for the painful and perfect expression with which he ends the piece. If pretense were pennies I'd be rich! Oie Chris! No reason to feel embarrassed about the 'There's no their there' post. I thought it was good. I also think along these lines. I believe I am very pedantic when I write. I was probably trained that way - but I am also attracted to that style of writing too. I enjoy reading it. I know I need to make an effort to appear more friendly when I write. In person I am completely open and unassuming. Quite the opposite of how people perceive me in a 'literary' form. I don't know why things come across sometimes as they do when I write - I probably like to provoke argumentative thought because when people are intellectual about it- it is really good. The 'Socratic argument' is the style I was trained in. Unfortunately it is too easy to be too emotional about everything. Most people are far more emotional than intellectual. I have to work hard to change my style, because people too often take it the wrong way it is intended. But it is not embarrassing to me, not in the least. I only wish people could relate on and intellectual level rather than write it off as a personal offense . You shouldn't be embarrassed either, on the RARE occasion you pick up the pedantic gauntlet too. Carry on my son! Many of us can appreciate it. And I also want to say your brother is right! Record young Krapp's lines - you have nothing to loose and it is a brilliant idea. and I've always wished T Williams were my uncle. I see the bond, dove. Always nice to see you and the bridge on my blog! If there's one thing I've learned, it's that you cannot control how others perceive you. I have spent too much time in life worrying about how others feel about me. Be yourself and the folks you're meant to be around will find you. Sounds like you know that, though. Yes, wouldn't it be fun to spend a weekend with Uncle Tenn?